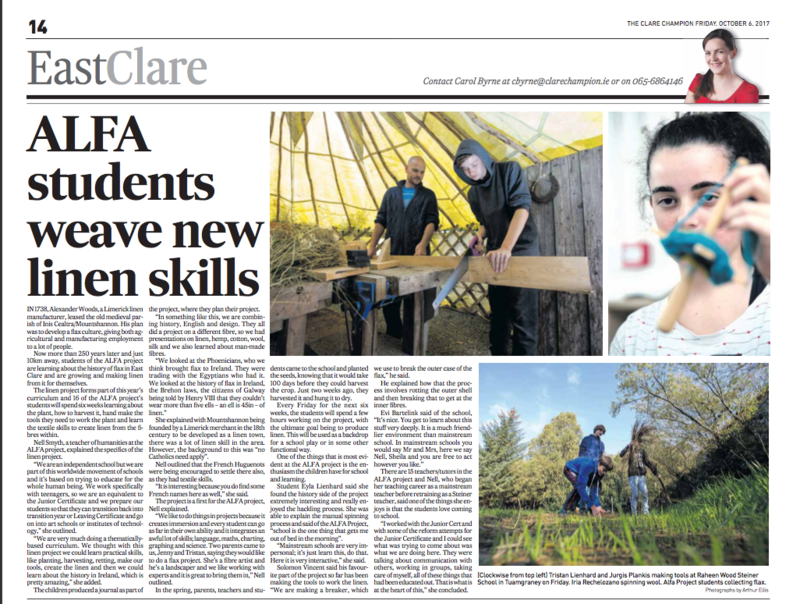 Irish Independent 01/03/2012 "Down in the woods where kids learn reading, writing and Eurythmics"
"Education based on theories of the Austrian mystical philosopher Rudolf Steiner is thriving at Raheen Wood in east Clare. In the middle of a wood near Tuamgraney, there is a Steiner kindergarten, a national school, and a tiny secondary school, which runs an alternative to the Junior Cert curriculum known as the Alfa Project. When I visited the secondary pupils they were rehearsing a play based on the Anglo-Saxon myth Beowulf, where pupils used puppets that they had made themselves. During breaks in lessons the pupils walk cheerfully between wooden huts, surrounded by trees, flowers and streams."